Well, 2018 was not a great year for everyone. Especially for crypto traders. Though it started really well, it gradually faded little by little. In spite of all the ups and downs happening, there are many folks who still believe in Crypto and the blockchain technology and that is the reason why you still see me here. Okay, I’m not going to bore you guys by talking facts that you already know. I believe that 2019 will be a great year for the crypto world, if not a great year, it will still be a better year than 2018. That’s what I really feel. I will start off with my basic starts for the monthly report. Before getting there yet, I would like to thank @jlordc. The reason is that I got this inspiration to share a monthly report only from him. I have seen him sharing a monthly report with some interesting data that also details how he is progressing every month. He has been doing it for several months already and I’m really late to this. But never too late. When the year started, I thought I should also be doing something similar because I really love Stats and when I see my stats regularly, I really feel more comfortable and happy. That is the main reason why I wanted to do this. I’m planning to post a monthly report every 1st of the Month. Hope there should not be any challenge in doing this. 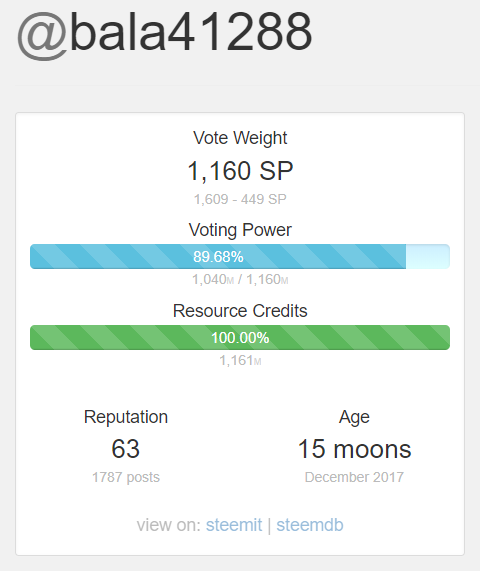 There are many tools available to check your stats on steem blockchain. 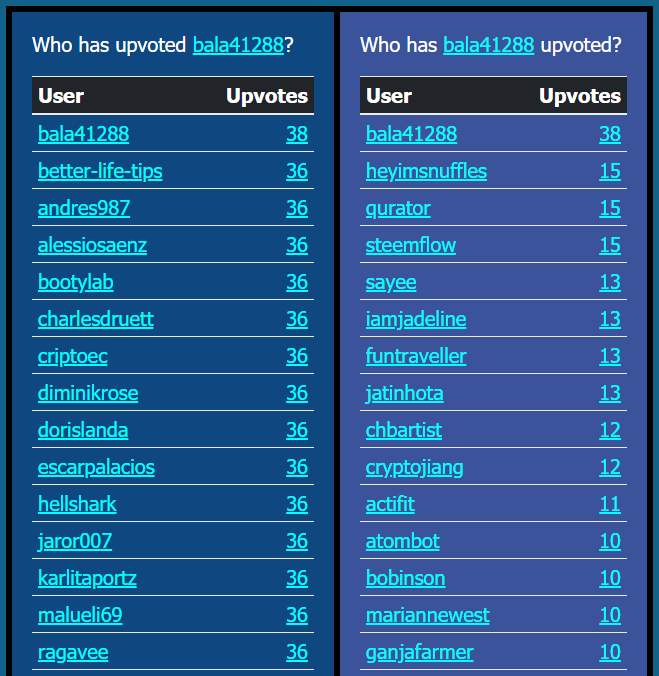 In this article, I have used steemfriends.org to check most of my stats. And of course, I have also used steemd.com and steemworld.org as well. From the above table, I don’t really understand how UA scoring works but it is good to monitor that as well. So, I have added it to the list to compare and see with next month’s value. 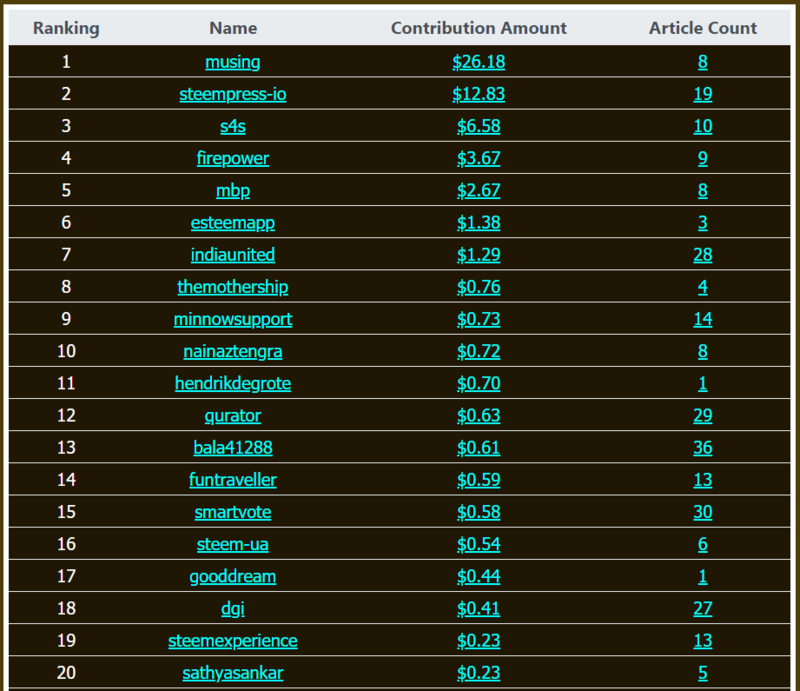 I have filtered out the list of contributors only from the last month. @musing has been the top contributor for me till date. But unfortunately the community lost big delegation recently and there is not much activity happening on the website. It can be challenging to continue the contributions in the website without any support. The maintenance and server costs can also become an overhead for @jonching if there is no support in the future. We have not heard anything yet but let’s see. Most of my articles are posted from my blog with the help of an amazing plugin called SteemPress developed for people who use wordpress. I have been really consistent on writing articles. I make sure I at least write a minimum of one article per day. Thanks to @steempress for the support. Next major support that I received was from our Indian Steem hero @firepower. Though we run a community called @indiaunited, we are not very powerful yet to support many Indians. But @firepower is really very helpful for Indians and have made Steem Blockchain very popular all over India. I would like to thank @firepower for his continuous support to Indians through curation. I’m really waiting to meet him in person soon. I would like to thank my other friends who have been really supportive last month. Tagging a few (not in any specific order) @bobinson, @sayee, @sathyasankar, @face2face, @nainaztengra, @inuke, @steemflow, @funtraveller, @akdx. I know very well that I need work a lot on engagement with the community members. I was part of @dgi’s voting trail and I’m still a part of @indiaunited voting trail as well. This usually drains my Voting mana. But at times, I really admire some of the posts and upvote them manually. From the below stats I’m able to understand that I have to increase my engagement with the community. The most convincing part for me in the above stats is that I don’t use bid bots and I’m not really a big fan of it. When I initially tried it during the early days, I ended up only in loss. But, I have delegated my SP to some of the projects that automatically cast votes using an automated voting mechanism, I’m really happy that I’m able to still survive here without using bid bots. I thought of adding more stats to the post but I’m going to stop right here because it was already so exhausting to make this post. The stats made me do lots of analysis and dragged to so many things. But it was definitely fun to look at my stats. I would like to recommend this activity of self-analysis to all my friends. It was really an interesting activity that gave me lots of motivation. I’m hoping to see a considerable improvement on my stats next month.